The painting shows the python Julunggul [sic], who appears in the sacred Wagilag Sister's Story. A simple version of the story goes like this. 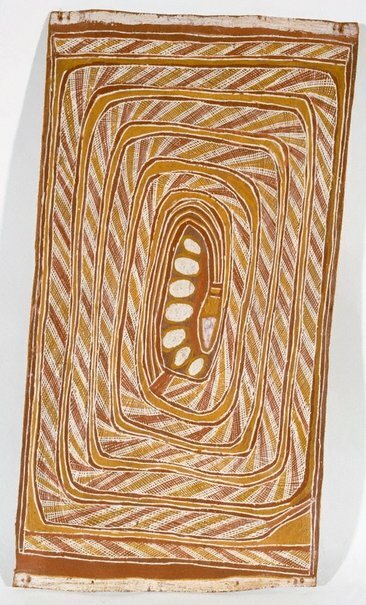 The Wagilag are two sisters who traveled from south Arnhem Land (the Roper River area), eventually reaching a sacred waterhole or well in which, unknown to them the python Julunggul lived. The foods which they caught and collected, when placed on a fire, jumped up and disappeared into the waterhole. When one of the sisters gave birth to a baby, Julunggul smelt the afterbirth blood. Disturbed by this and by all the creatures jumping into his waterhole, the monstrous python emerged and swallowed the two sisters and the child. According to one version of the story, this symbolized the onset of the monsoon season. Later he vomited them up. Virtually the complete surface of the bark sheet is taken up with Julunggul, resting coiled with eggs at the bottom of the sacred waterhole. Jonathan Cooper (Editor), The Art Gallery of New South Wales Bulletin , 'Yiribana', pg. 23-25, Sydney, Aug 1997-Oct 1997, 23 (colour illus.). 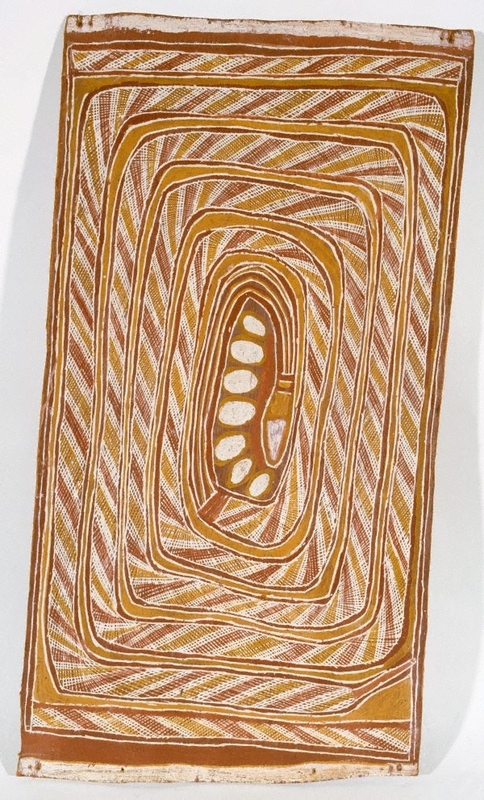 Cara Pinchbeck, Art from Milingimbi , ‘Dawidi’, pg. 64-71, Sydney, 2016, 71 (colour illus. ), 140.